​TaKeTiNa is a transformational group process, working with the powerful tools of poly-rhythm, voice, movement, and somatic awareness. Sometimes referred to as the Yoga of Rhythm, TaKeTiNa invites participants into a state of profound stillness, awareness, joy, and connection. We are excited to offer this full weekend retreat (non-residential) at one of Melbourne’s most peaceful and beautiful venues, The Michael Centre in Warranwood. An opportunity to immerse yourself in an enlivening group process, we will work with the theme of finding balance, flow and integration even when navigating significant chaos, whether internal or external. At this time in history we are facing unprecedented chaos and over-stimulation in the world around us and in our busy lives. When left unchecked, this can easily lead to states of overwhelm, anxiety, disconnection, and low vitality. The retreat will be a space for deep rest, healing and revitalization as we drop into a profound experience of primordial rhythm. No musical experience is necessary and participants are invited to journey at their own pace within this safely held and dynamic group process. Participation in TaKeTiNa leads to a perceptive state which can be described as ‘simultaneous awareness’. Poly-rhythm has been used for millennia among all cultures as a tool for healing, celebrating, and evolving our true nature. TaKeTiNa is used today in diverse fields as music education, therapy, meditation, peak performance, and personal growth. TaKeTiNa is a process for activating human and musical potential through rhythm. It is a path in which learning goes hand in hand with personal development. TaKeTiNa is a gentle and powerful way to explore the connection between consciousness and body. The experience is both deeply restorative and energising. Note: This event is not specifically oriented towards musicians/performers. TaKeTiNa can be applied to any profession or aspect of your life. If you are able to offer a ride or need a ride, please enter your details on this private rideshare board. Feel free to also post directly on the Facebook event page. Note: The venue is tucked away and can be easy to miss. The entrance is located in a residential neighbourhood at 37a Wellington Park Drive, Warranwood. FREE PICK-UP from RINGWOOD Station – If you are travelling by Public Transit we are happy to offer free pick-up from Ringwood station on Saturday and Sunday at 9:40AM. This must be booked at least one day in advance via SMS with the organiser, Andy Harrison. 0417 561 473. We will also ensure that you have a ride back to Ringwood station with someone from the workshop. We encourage you to stay on site and (optionally) bring a plate of food to share for lunch on Saturday and Sunday. Alternatively, the nearest cafes are about a 5 minute drive from the venue. Lunch break is an extended period, usually about 1.5 hours to allow for integration of the work. Please bring a bottle of water to stay hydrated, and a blanket, shawl, or mat to lie on during the rest periods. You may also wish to bring a notebook and pen for writing / drawing during the integration periods. Michael is passionate about music and healing. He combines experience as a studio musician with deep knowledge of the role of rhythmic intelligence in somatic health. His background as a physiotherapist includes over 20 years developing methods for awareness, perception and movement of the body : The TaKeTiNa process is unique as an opportunity for deep embodiment and a space to explore the connection between consciousness and soma. Ria Soemardjo is a Melbourne based musician with a passion for collaborating with artists across diverse range of genres and artforms. Her distinct, haunting vocal style reflects her Australian/Indonesian cultural heritage and she draws on her love for Balinese and Javanese musical traditions in her song writing and collaborative projects. A fascination for exploring voice and movement lead her to train as an Alexander Technique teacher, and she taught at the School for FM Alexander Studies for several years, with a focus on the practical application of this approach for voice and performance. 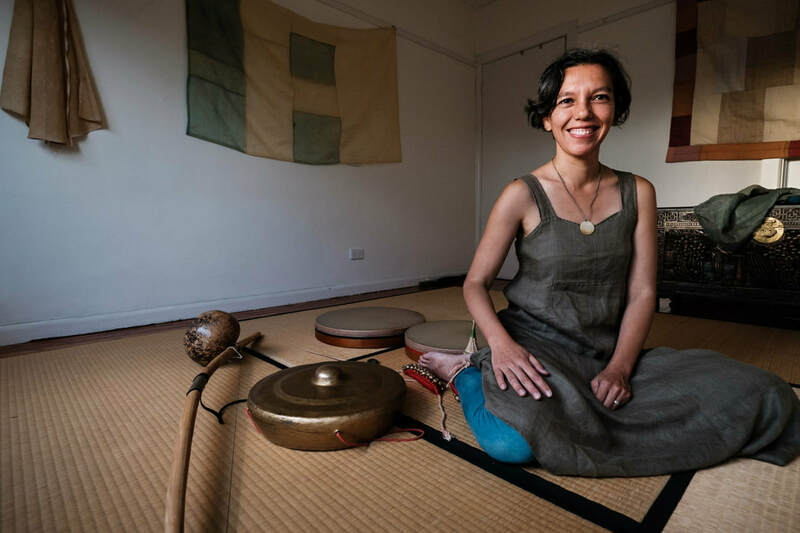 In 2018, she will complete her training in a cutting edge approach to rhythm/voice training - Taketina Rhythm Process, and share this work through group workshops. Andy Harrison has been involved in TaKeTiNa Rhythm Process since 1999 and is passionate to share this unique work with community in Melbourne. He is Director of Melbourne Piano School. Situated in a tranquil bush setting in Warranwood, the Michael Centre was designed by renowned Australian architect, Greg Burgess. Our workshop takes place in the beautiful pentagonal Movement Room. The venue provides the perfect setting for TaKeTiNa journeys and is a comfortable heated space. A kitchen is available for use during lunch. "Rhythm is one of the most ancient and efficient ways to influence and develop human consciousness. In our globally-networked and technologically-focussed world, human beings often lose touch with their own internal rhythms, making them feel displaced and de-synchronized. TaKeTiNa allows them to reconnect with the healing powers of rhythm and primordial motion. Social, mental, creative, spiritual and of course musical faculties are reawakened and developed with the practice of TaKeTiNa."